Since Pepsi-Cola and Frito-Lay joined forces to become Pepsico in 1965, the corporation has been one of the top brands in its industry. Pepsico’s iconic products, such as Pepsi, Lay’s potato chips, Gatorade, Aquafna water, and Fritos corn chips, have become ubiquitous throughout the United States and internationally. The company has estimated revenues above $108 billion and over 270,000 employees worldwide. A senior level executive for Pepsico’s Supply Chain Capability (the department that manages the complex workflow from Pepsico’s suppliers to its customers) contacted Excel Consultant to ask for assistance with her division’s on-boarding capability program. She wanted help improving the analytics for tracking participant certification around her new team members’ monthly scorecard, a packet of information about their training progress. Basically, she wanted to make the most of the information gathered by the scorecard and enhance the interface used to view it, including the appearance of the charts generated and the layout of the dashboard. Our Irvine, CA team worked closely with the Pepsico Supply Chain division to meet and exceed their needs. First, we created a series of key columns in the training data so that our formulas could better segregate it as needed for display. This makes the scorecard simpler to read and interpret. We also added improved functionality enhancing the dashboard with an intuitive interface using conditional formatting to highlight employees’ highest scores automatically. In addition, we made it possible to filter the data by new team members’ start and end dates making it easier to track progress. At Excel Consultant, our mission is always to go above and beyond our clients’ requests. In addition to fully addressing Pepsico’s original concerns, we further enhanced the department’s on-boarding and scorecard functionalities. Our expert programmers streamlined the data load process by modifying the existing code to better format the raw data collected and added code to automatically move it from the “Data” file to the scorecard. This eliminates extraneous information so that the actual scorecard file is as small as possible. We also added new logic for creating and opening scorecards based on the client’s specific feedback and requests. In addition, we added the capability to email the completed scorecards to individuals, making inter-departmental communications more efficient and effective. The email component we created used a dynamic list of names and email addresses. It also included a fully customizable subject and body text based on the status of the employee. 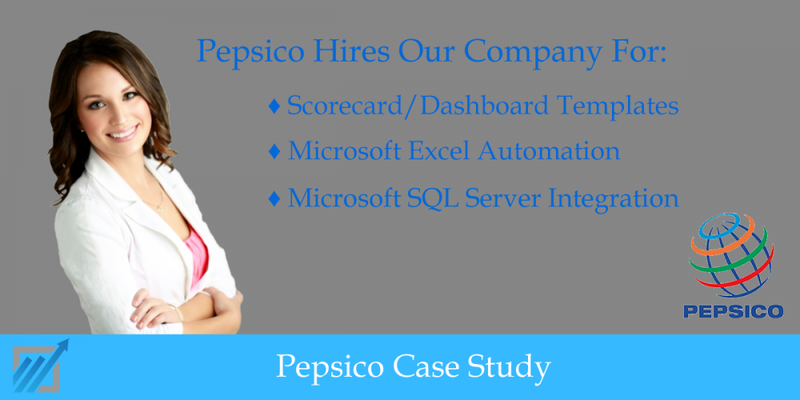 We took this project as a jumping off point to revamp Pepsico’s Supply Chain on-boarding and scorecard tools, allowing them to better assess their employees and achieve department objectives. After this positive experience, we have completed numerous repeat projects with this client, continuing to enhance their operations.